Dan Ryder is an improviser, design thinker, and Twitter chatter at #dtk12chat and #EdCorps. He is an Apple Distinguished Educator for 2017 and co-author of Intention: CriticalCreativity, which can be purchased here. Dan can be found on Twitter @WickedDecent and on the web at danryder207.com. Here is a great article by Dan for design thinking in the ELA classroom. In this episode, Cade references John Spencer. John is the author of Launch: Using Design Thinking to Boost Creativity and Bring Out the Maker in Every Student, which may be purchased here. John may be found on the web at spencerauthor.com and on Twitter @spencerideas. We are grateful to Laura Fleming for introducing us to Dan. Laura knows all things makerspaces and can be found at worlds-of-learning.com and on Twitter @LFlemingEDU. IDEO’s Teachers Guild is another great resource for design thinking. Check it out here and on Twitter @TeachersGuild. This article from Edutopia does a great job of explaining IDEO’s model for design thinking. Michelle’s first try at design thinking in her class is based on the first unit of her freshman PreAP English class entitled “Heroes and Social Injustice.” As an introduction to the unit and to design thinking, she challenged her students to create a modern Justice League for 2017. The challenge is to create a team of heroes to save people from current social injustices occurring today. The empathize phase of the process requires students to research social injustices and to empathize with the needs of the victims in order to determine what the heroes will need to be able to do. The define phase had students combining all of their research and choosing one injustice on which to focus based on the amount of empathy and knowledge they have developed over the course of the empathize phase. Then the students are ready for the idea phase where they actually begin creating their heroes. During this phase, they are given a rubric for the testing phase so they can better prepare. The prototype phase requires them to create a prototype that will help them in introducing their new Justice League to the public, first “selling” this new concept to me, the one who will determine if their product is worthy of moving forward. Then the testing phase is the sales pitch. They collaborate with their group to create the most convincing pitch for their audience, in this case, their English teacher. They record their presentations on Flipgrid so that all classes are able to see the presentation. Michelle’s #thestruggleXtheHall for the project has been getting the students to empathize and to dig more deeply into the realities of the victims of social injustice. They tend to skim the surface of the problem and focus more on the heroes than the victims. This challenge requires a great deal of guidance and one-on-one conversations with the groups when they get off track or do not know what questions to ask to get to the heart of the victims they are setting out to save. As you try design thinking and using makerspaces in your classrooms, please share with us. We would love to know how it is going and possibly even create a resource for other teachers to access lesson plans. 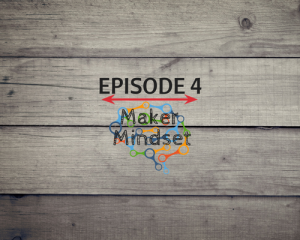 Listen to “ATH E4 – Maker Mindset” on Spreaker.